This is a spicy, fruity dish. Can be enjoyed as a starter or side dish (excellent with fish). 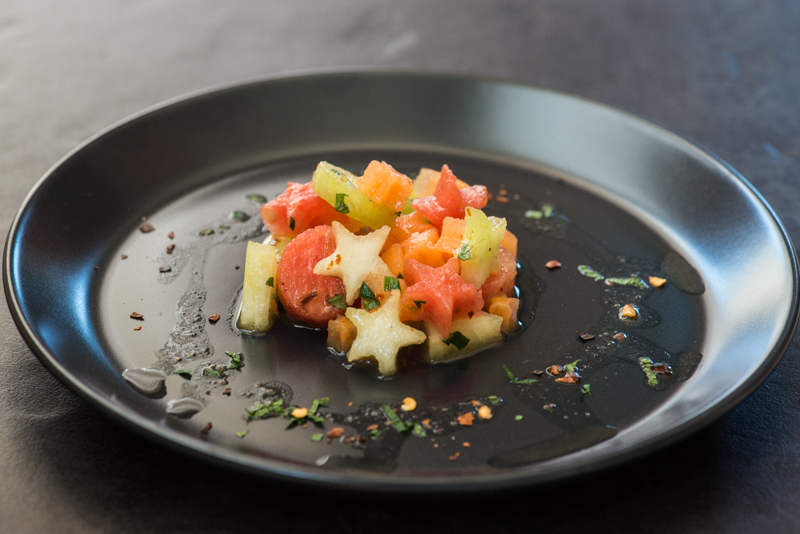 It is fun to use cookie cutters for creating melon stars, circles etc. You need some different types of melon (Water melon, Cantaloupe, Honeydew…) cut in thin slices and then cut into shapes. I use cookie cutters for this. 2. Pour over small pieces of melon. A bit of a surprise dish. 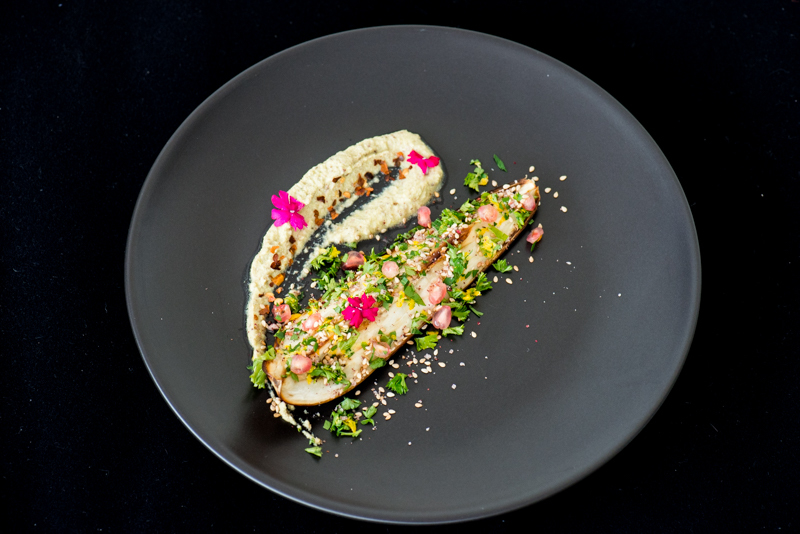 The crumble looks like an apple pie, radishes are seldom served roasted and the frozen dressing will slowly melt into your salad. They all taste great on their own and go very well together. Just be sure to make the dressing ahead and allow 2-4 hours for it to freeze before serving. I love making frozen dressings. It makes for such a fun presentation. This technique can be used with any dressing, sauce, dessert sauce that can be served cold. For the miniature pie tins, either choose ceramic ones that the pies can be served straight out of, or, as I did here, the kind with removable sides. 1. Set the oven for 200 C.
2. Chop all the veggies into small pieces. Mix with the yoghurt/crème fraiche). 3. Place in two miniature pie tin. 4. Combine the dry ingredients for the crumble. Add the oil last and keep the crumble “crumbly”. Best done by hand. 5. Spread the crumble on top of the small pies and set in oven for about 15-20 minutes. 1. Set the oven to 220 C.
2. Trim the radishes and cut in half. 3. Drizzle with olive oil and season with the salt. 4. Roast in oven for about 20 minutes, until they start to colour. 4. Just before serving, break the frozen sheet of dressing into smaller pieces and stick into salad. An easy but delicious veggie meal. I like when the cabbage gets almost a little burnt on the edges (although I know this is totally unhealthy). 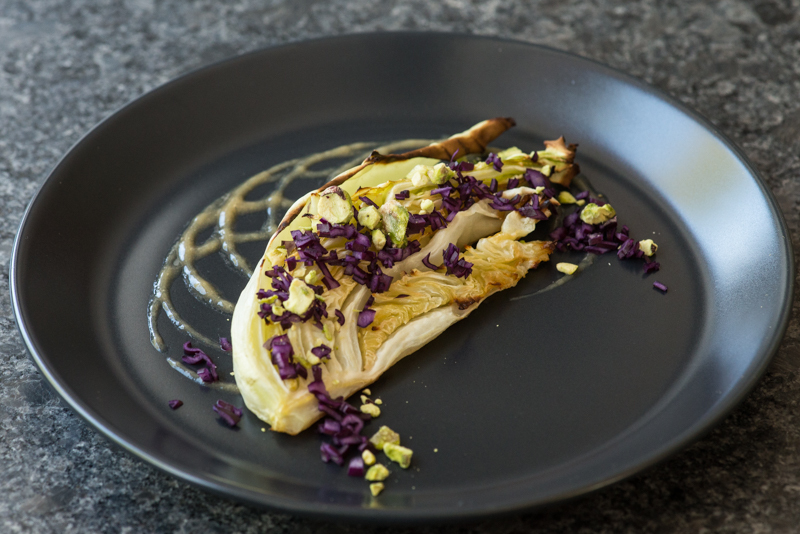 The dressing is both sweet and sour and contrasts nicely with the cabbage. 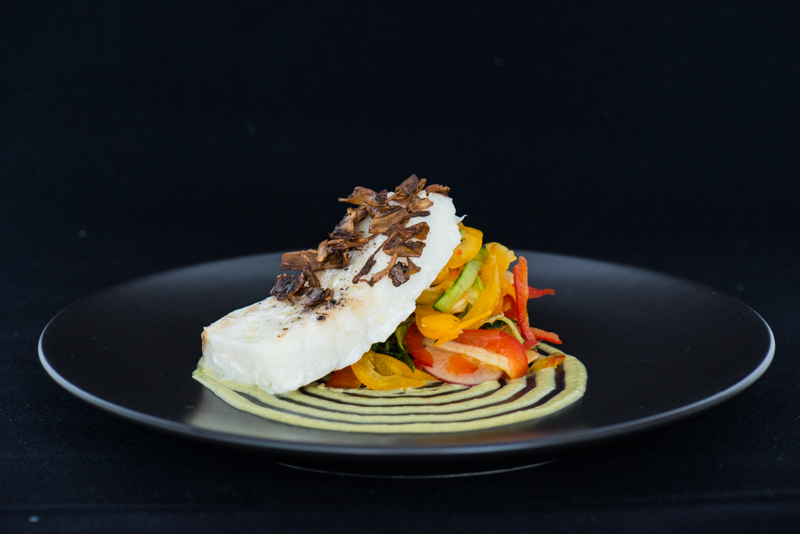 The topping provides a colourful and tasty crunch! 1. Pour the dressing into a wide bowl. 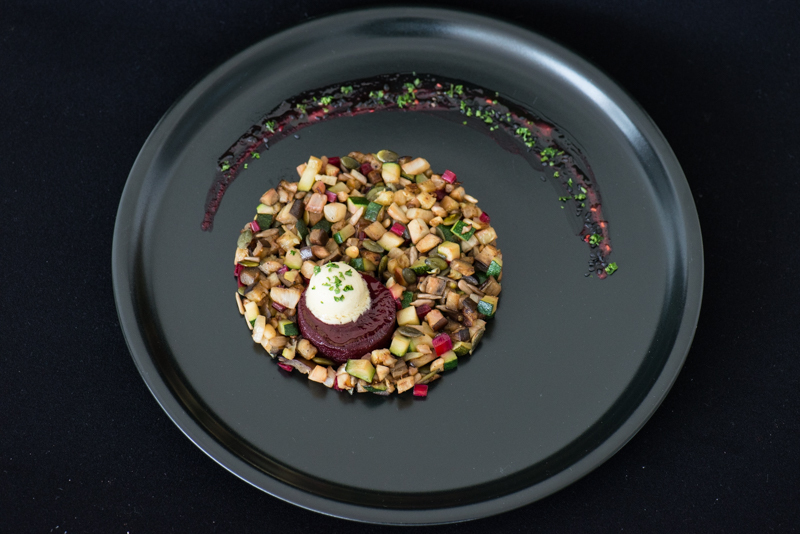 Dip the top of a glass into the dressing and press down on a plate to create a circle. Redo this several times, just moving the place for the circle by a little each time. 2. Place the cabbage on top. 3. Drizzle with the topping. 4. Serve with some extra dressing on the side. Really just a simple salad but the raspberry vinaigrette makes it into something extra special with its sweet and sour taste. 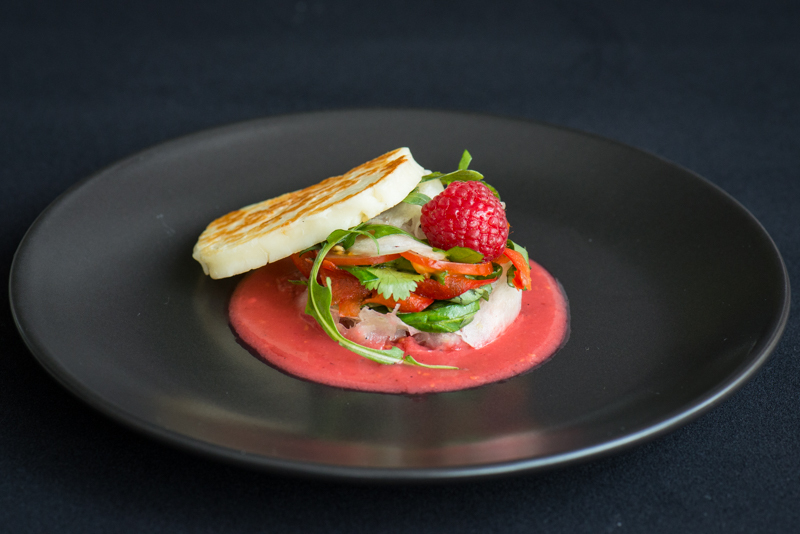 The sweetness of the raspberries goes really well with the saltiness of the Halloumi. Don’t forget to add some black pepper for som nice heat. I have no quantities on the salad or the Halloumi but the dressing should be enough to serve 5-6 people. 1. Process vinaigrette ingredients in blender adding the oil last. If you want to get rid of the small raspberry seeds, please strain the dressing (best before adding the oil). 3. Mix the salad components in a bowl. For this salad, you really need a mandolin and a sharp knife. It may seem like a lot of cutting but it is all well worth it. The result will be a stunning salad where all the flavours blend nicely. The fried Jerusalem Artichokes both adds a nice crunch to the salad and a fun, extra flavour. Don’t forget to pile the salad up high when serving – makes for such a pretty dish! Bell peppers in several colours – cut into quarters (lengthwise). Press down flat on cutting board, skin side down. With a sharp knife held horizontally to the board, cut of top layer of the white(-ish) flesh so that you are left with darker coloured flesh and skin. Then cut into thin long strips. Pomegranate – if ripe enough, just squeeze it well before opening (in 2 halves) and then squeeze out the seeds (they should fall right out). If not as ripe, you will have to cut them out. 1. Fill a very large bowl with ice water. Place the fennel and bell pepper strips in the water for 1-2 hours. They will come out curly and crisp. 2. Peel and then slice the Jerusalem Artichoke thinly on a mandolin. 3. Fill a heavy duty pan up to maximum a third full of a neutral oil (no more than that as the oil will splatter when frying). Heat the oil, test for readiness by dropping a slice of the artichoke into the oil, if the oil bubbles around it then it is ready for the frying. Add a handful of artichoke slices, let fry until a bit curled and golden in colour. Take out with a sieve and let dry a bit on paper towels. Put the next batch in and repeat the procedure. Salt and store in a dry jar. 4. Combine all ingredients (except the oil) in a blender. Process until smooth. Slowly add the oil – do not over process. Refrigerate until use. 5. Place all the prepared vegetables (except the Jerusalem Artichoke) in a bowl. Toss them to combine. On a plate, drizzle, pipe or spoon the dressing and then pile the salad high on top. Lastly, add the fried artichoke. 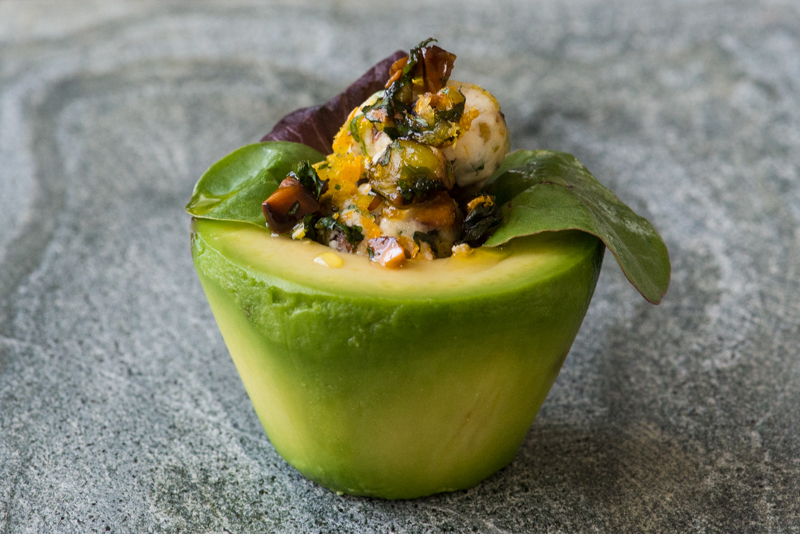 This Avocado Cup is easy to make but takes a bit of time in the preparation. The Macadamia nuts must be soaked for about 8 hours before blending. The stuffing is wonderfully nutty and can be used in many other dishes, on crackers or as a dip. 1. Soak the macadamia nuts in water over night. 2. Rinse the macadamias well and place in blender together with lemon juice, nutritional yeast and salt. 3. Process until smooth. Add some water if needed. You want a texture as thick as peanutbutter. Set aside. 4. Combine the pistachio, herbs, zest, chili flakes, salt and olive oil in a separate bowl. 5. Take out a bit of the pistachio mix and keep on the side for later decoration. 6. Combine the contents of the two bowl. Set the bowl with the macadamia mix aside. 7. Cut the avocado in halves. NOT lengthwise as usual but across the middle!!! 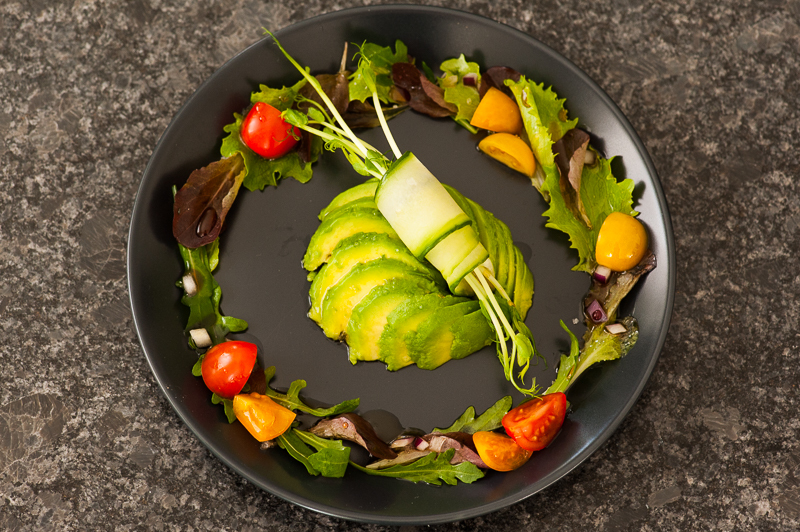 Cut off a thin slice in each end so that the avocado half will steadily stand – like a cup. With a sharp small knife, peel the avocado by cutting around the flesh as close to the peel as possible. 8. Place one half on a plate. Put a few small salad leaves in the middle, add the macadamia mix, sprinkle some of the extra pistachio mix on top and drizzle with a few drops of olive oil. Great and quite filling lunch or a good side dish to the BBQ. Remember to chop the veggies in very small cubes as this gives a much better and blended taste to the ratatouille! The Frozen Lemon Nut Butter needs to be made a day ahead (the almonds, thus, must be soaked for at least 12 hours before you start the nut butter recipe). This butter is great with many different dishes. 1. Combine the almonds and water in a blender, run until a smooth paste. 2. Combine the olive oil, part of the almond/water mix, lemon juice, lemon zest, salt and (if you want it spicier) a dash of chili flakes/ground black pepper and, to better stay blended, a pinch of lecithin. Process in blender until smooth. 3. Pour into small ice cube molds (or praline molds) of silicon. Freeze 12 hours (until solid). 4. Why not make your own flavor frozen nut butter with the remaining almond cream? If so, please post you result in the comment section of this recipe! Save the small end bits for the beetroot oil. 1. Mix the end pieces with some oil in small blender (or handheld mixer). Strain if necessary. 1. Chop the aubergines (eggplant), stalks, zucchinis and bulb into small cubes. 2. Fry a few minutes in a pan with olive oil, season with salt, pepper and lemon juice. 3. Toast the seeds and add to ratatouille. Looking for a festive Easter holiday meal? 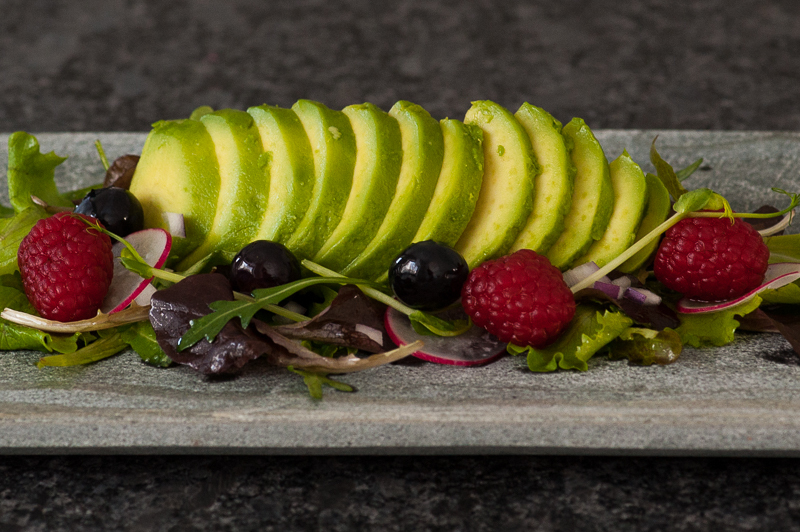 How about this dish with a creamy avocado sauce full of flavours and Easter colours. A light dinner that goes well with all that Easter candy. 1. Run (all except the oil) in blender until a smooth mix. Taste, add some salt and chili powder if needed. 2. Add the melted coconut oil. Mix briefly. 3. Set aside. The sauce will be served at room temperature. If you want it warmer, either heat in blender (then wait with adding the oil until the sauce is warm enough) or on the stove. 1. Pour the oil and spices over the cod. Steam the fish in a steam oven, bake in an oven wrapped in aluminum foil parcel or in a steaming basket in a pan on the stove. 1. Pour the tamari, lime juice and salt over the mushrooms. Let marinate 30 minutes. 2. Fry in a bit of olive oil until all liquid has evaporated. Serve as is or add some toasted pecans and Quinoa. 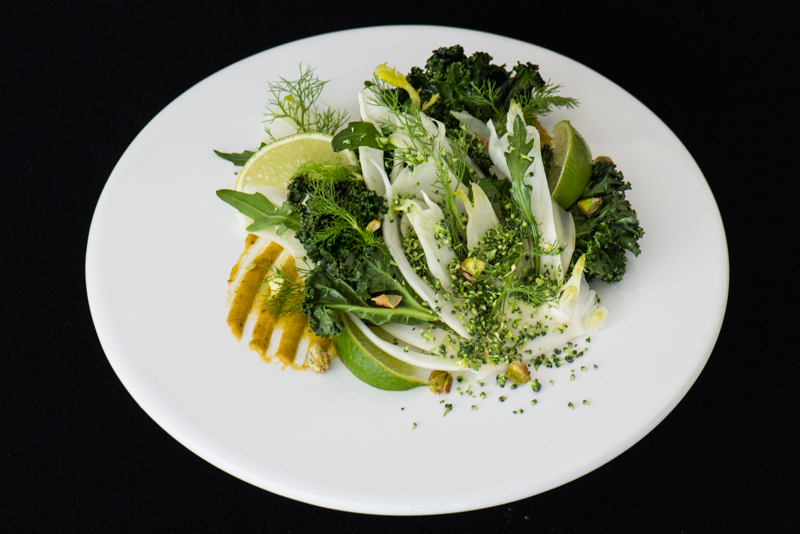 Crunchy all green salad with a wonderful dressing. The pistachio dressing is a must try!! 1. Run in blender until smooth. If too thick dilute with some water. 1. Cut through the middle and through the root then slice very thin using a mandolin. 2. Place in ice water for 30 minutes so the fennel curls up. Mango ceviche can be served on its own as a great starter, or here, as part of a light meal. 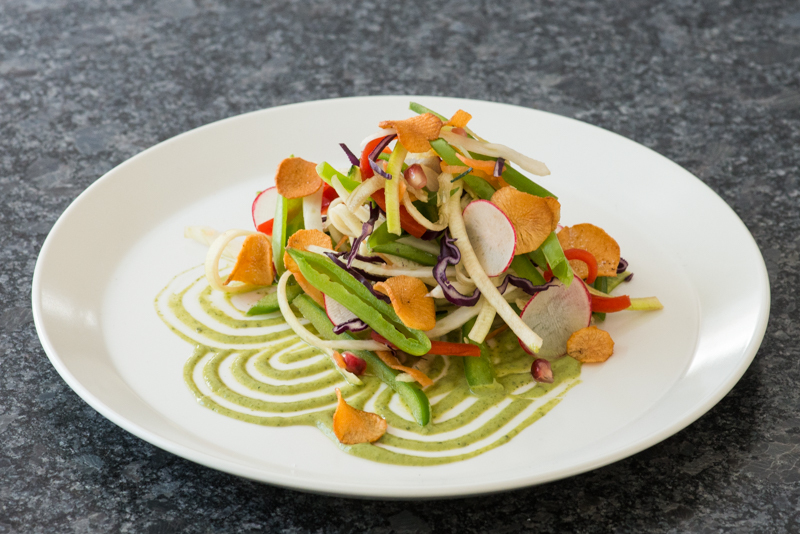 The pine nuts and cucumber provides some crunch to this fruity/spicy meal. 3. When quinoa is done, take off heat and add the broccoli and the cheese, put a lid on and set aside. Add some pine nuts (keep some for the decoration). 5. 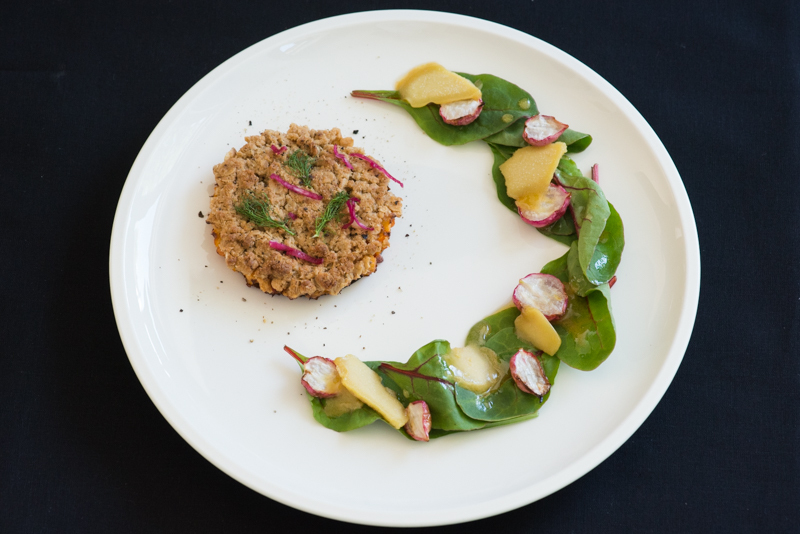 Serve the ceviche in gem lettuce with the quinoa on the side. 6. 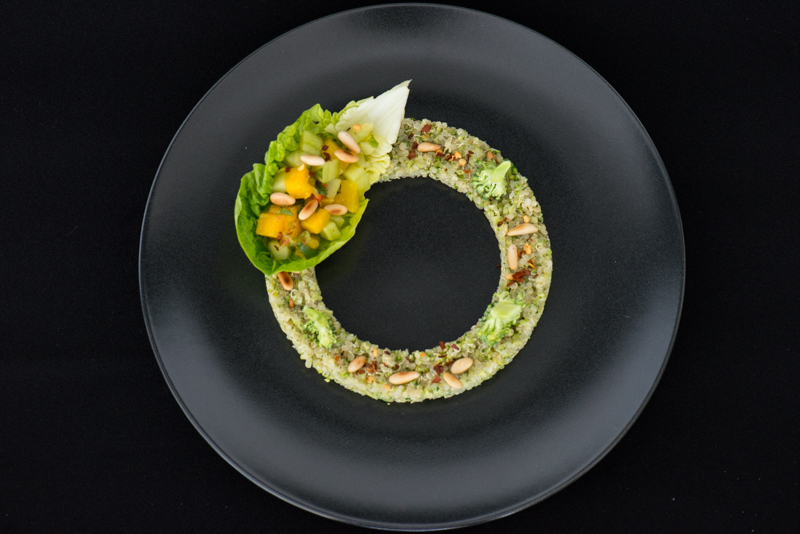 Cut some thin strips of the reserved piece of broccoli and, for an interesting effect, place them on top of the quinoa as an up-side-down tree. Try it and let me know if you liked it! 1) Choose a nice vanilla ice cream or make your own, nut based, alternative (please see this recipe: http://www.theglutenfreegourmet.co.uk/strawberry-ice-cream-dairy-free/ or this http://www.theglutenfreegourmet.co.uk/cinnamon-ice-cream-with-coffee-reduction/ ). If you choose a nut based alternative, make it vanilla flavoured. 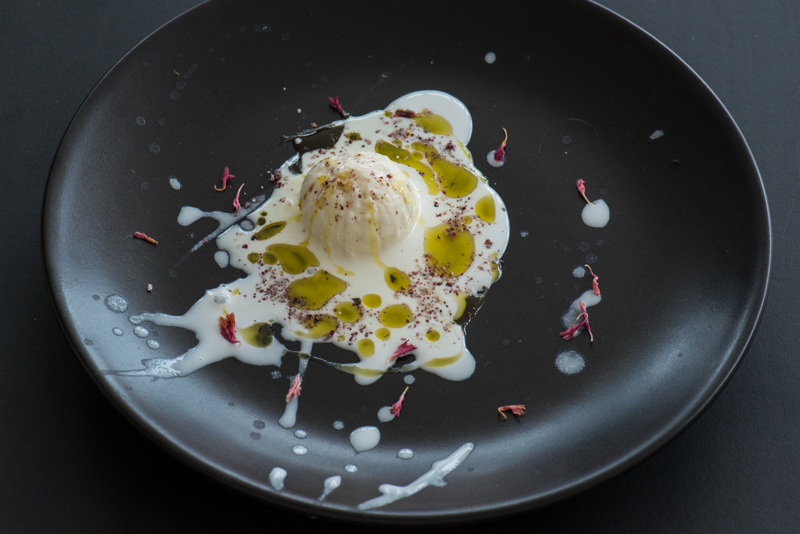 2) Choose a nice and fruity olive oil, drizzle on top of the ice cream. This is truly a superfood salad. Delicious, healthy and pretty! 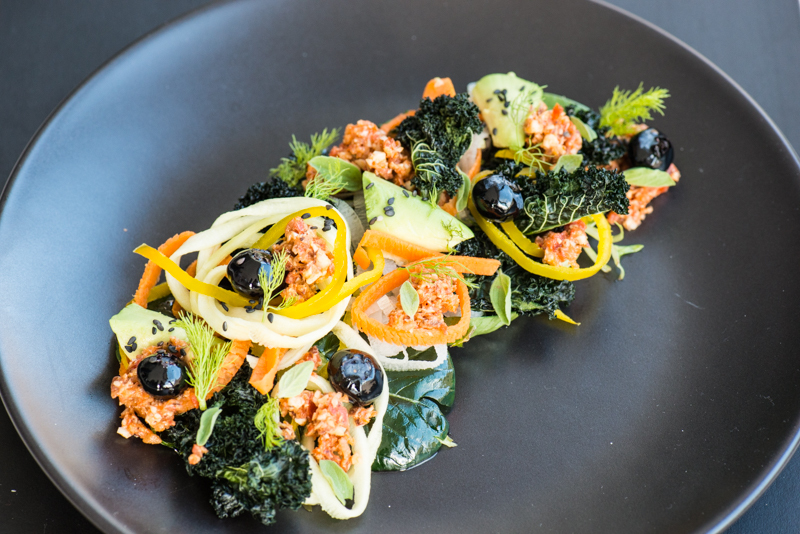 Inspired by the best vegan chef – Matthew Kenney. Quick to make but some items (kale and bell pepper) must be prepared in advance. Oh, and the Kale is great to eat just as Kale Crisps. Don’t have to go in the salad. 1. Wash and dry the kale. Tear into smaller pieces. Massage olive oil and salt into the leaves and either dry in oven on 80-100 C for about 30-40 minutes or dehydrate on 45 C for 12 hours. Until crisp. 2. Spiralize the carrot, and turnip. Soften with olive oil/salt marinade. 3. Cut the yellow bell pepper into fine strips. 4. Halve the avocado, insert a knife in the flesh and cut in a cirkel but do not move the tip of the knife. This will give you small cone shaped pieces. 5. Massage some olive oil and lemon juice into the spinach leaves. 1. Cut the pepper into large pieces. Roast (200 C for 30-40 minutes) or dehydrate (overnight) to dry the pepper out.You don’t want a too wet gremolata. 2. Cut the walnuts into fine pieces. 3. Pulse all Gremolata ingredients in a food processor into small chunks. 1. Roll the blueberries in some olive oil so they look pretty. 2. Separate the small leaves of oregano. 1. Place the spinach at the bottom. Continue with the other salad ingredients. 3. Sprinkle with blueberries, sprigs, oregano leaves and black salt. A sweet and sour cake, vanilla cream and plums, combined with a nutty, not too sweet crust – a rich and delicious dessert!! 1. Gently simmer the topping over low heat until soft and well combined. Just two simple salads, but the dressings really make them stand out. 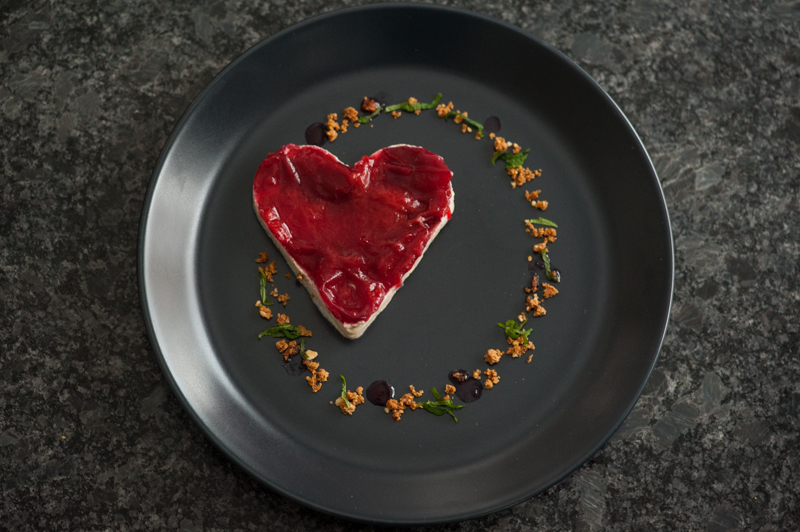 Nothing exceptional about them though, quick and easy to make (you probably have made something similar before) but I still wanted to share them as a reminder how a hint of sweetness really can make a world of difference to a dish. The first is a maple dressing. The hint of maple sweetness balances nicely against the fat from the avocado and the peppery taste of the rocket salad. The second is a raspberry vinaigrette. Coupled with a few raspberries in the salad it is as tasty as it is pretty. 1. Push the thawed raspberries through a strainer (to get rid of the seeds). 2. Mix with the other ingredients for the dressing. 3. Taste and adjust spices (raspberries varies in degree of sweetness).